A few of the right kitchen tools makes a BIG difference. Scroll down to see some of our favorites, or see our updated Idea List here! Keeping a kitchen frugal and efficient means you have every tool you need to make good food and a few things you want. I started out with the basics. Over the years, through research, trial and error, and experience, I collected the following tools. They aren’t absolutely necessary to cook great food, but they are insanely handy. 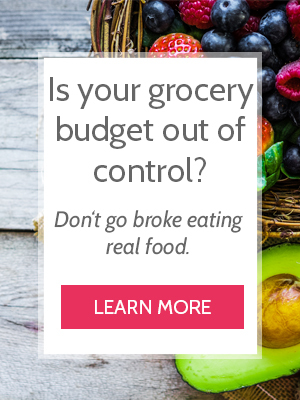 I use them all the time, and they help me save money while cooking healthy food. Please note that most links are affiliate links, which means I receive a small compensation if you make a purchase using the links. Your price stays the same whether you click my link or not. You can check my full disclosure policy here. In case it isn’t obvious, we prefer reusable items over disposable. Cloth napkins are easy, sustainable, and don’t add much extra work – especially when I make the kids fold them. For almost 10 years, I used a set given to me when I left West Africa. They clashed with everything, but who cares, because they’re from Africa. When they grew threadbare, I bought Pioneer Woman napkins in blue and red, because they’re adorable. My favorite dish cleaning tool. Removes baked or burned on food so easily. I’ve had a Pampered Chef pan scraper for 5 years, and it shows no sign of wear. Not just for potatoes. I use it for guacamole, egg salad, and even breaking up cold leftover oatmeal (which sounds like the grossest breakfast ever. Tastes better after heating and mashing with this handy tool). I know stainless steel and glass are all the thing, but they break or get cold/hot, and just don’t feel great in the mouth. I could get used to them, but I found these on Amazon and never looked back. They’re perfect. They fit in my cute, stainless steel Walmart brand Yeti knock-off, and they’re thick enough for smoothies. Also, I never buy straws anymore. If I drank hot things through a straw, I would buy stainless steel. But who even does that? Obviously necessary if I’m drinking smoothies through reusable straws. I didn’t think we would use this tool for anything else, but we actually use it all the time – cleaning bottles, lids, and nooks and crannies in random dishes (that apparently never got clean before I bought this. Gross. ), etc. If you’re not into making these kinds of foods, you probably don’t need a mesh strainer. If you are, it’s invaluable. These were a thrift store find. I couldn’t find the exact ones online, but I found something very similar (and cuter – less of a this-was-from-a-90’s-kitchen-and-I-found-it-at-a-thrift-store, look if you know what I mean). Making salad dressing takes about 30 seconds (longer the first couple times when you need to measure), and ensures that we’re only eating olive oil and ingredients I can pronounce. I recently started seeing salad dressing like that at grocery stores, but they’re expensive. Shaking a couple ingredients together in a bottle helps me save money and eat healthier. Of course, mason jars or upcycled salsa jars work great, but I found that we used – and wasted – more dressing because it came out so fast. The pop-up lids solve that problem. These were a gift, and I had no idea how often I would use them. Handy for measuring, serving, and the lids make it easy to store leftovers without plastic wrap. Storing dry beans, rice, cornmeal, oats, oat flour, nuts, nut butter, etc. If all my mason jars suddenly exploded and I didn’t have anymore, the first thing I would do is call Ghostbusters. The next thing I would do is order more from Amazon. FRUGAL TIP: I used to use empty salsa jars and such in place of mason jars. They aren’t as cute (and you can’t use them for canning), but they do the trick. I used to collect cute dishes. Then I started collecting cute kids who break dishes. As a result, we swallowed our pride and converted to Corelle. I love them. Sturdy, light, and chip and shatter-resistant, none of them have cracked despite numerous drops and accidents from said children. This blending tool is far more convenient for blending soups and marinara than dirtying a whole blender – especially since I don’t have a big one anymore (see Nutribullet schpeel). My Hamilton Beach stick blender (from Walmart) was only $12, and it’s still going strong 5 years later. BONUS TIP: I would recommend the kind with a whisk attachment – so easy to whip egg whites this way. Amazing for bulk cooking pancakes, tortillas, English muffins, etc. I prefer electric over the kind you put on the stove because it heats more evenly. Ours was a wedding gift, and I can’t count the number of times I’ve used it. In fact, the friend who gave it to me reads this blog. Thanks, Mary Hannah! My $5, unbranded, yard sale food processor lasted nearly 6 years, so I don’t think you need an expensive brand to make great food. For now, my Black and Decker works great. Someday, I want a Vitamix or a Blendtec. Right now, a Nutribullet is the next best thing and costs a fraction of the price. It’s extremely powerful (normal cheap blenders don’t even compare), and I love the individual cups for blending. Since we all like different things in our smoothies, no one has to compromise. Exactly the way a family of millennials likes it. FRUGAL TIP: We also saved some money by purchasing it refurbished. I’ve had a slow cooker my entire adult life. It’s a key tool to eating dinner at home whether you work all day or chase your kids around all day. I’ve only ever had a manual slow cooker, so I can’t make any claims about the programmable ones. It works great. The real game changer was the Instant Pot. Someone sent one to me as a gift (see the unboxing here), and I’ve been experimenting with it for several months. The 10-in-1 has a slow cooker option, and we put this machine to work multiple times a week. I love this thing. It was an investment upfront, but it has paid for itself many times over the years. I only recommend this if you love baking. Because that’s kind of the point. Store bought whole wheat flour has nothing on freshly ground flour. NOTHING. It’s a game changer for making delicious, whole grain bread. NOTE: There’s some debate about whether the Wondermill or the Nutrimill is better. I chose the Wondermill because I liked having a separate flour storage container. Fresh flour should be frozen or refrigerated, and I don’t like dirtying more dishes than necessary. That’s how I slowly grew my kitchen into a frugal and efficient space. What would you add to this list?